While React VR is new, we can’t help but imagine what opportunities WebVR in general could mean for different businesses and industry needs. We’re seeing an increased interest in virtual reality, and it’s no surprise. It is allowing companies to offer experiences they haven’t been able to before. First, some background. VR is poised to grow exponentially over the next couple years. According to Statista, the economic impact of VR and AR combined is projected to reach $29.5 billion U.S. dollars in 2020 in a high growth situation. 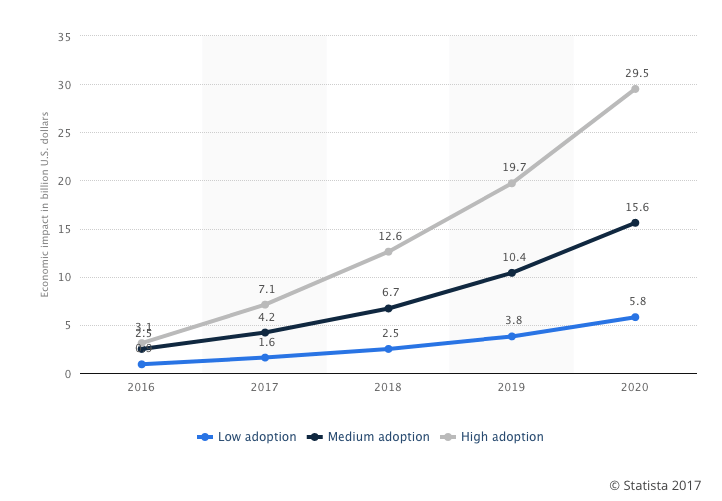 In a low-adoption scenario, these numbers are forecast to reach $5.8 billion (U.S.), and at a medium-adoption scenario, the economic impact would reach a projected $15.6 billion (U.S.). 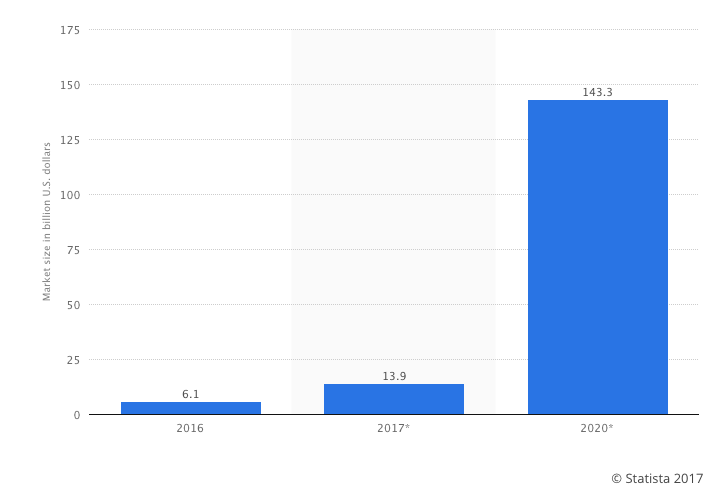 In terms of global adoption, VR/AR is forecast to reach a market size worth $143.3 billion U.S. dollars by 2020, a massive increase from where it was just last year at $6.1 billion international market share. While the gaming industry makes up for a large amount of this forecast, it is not the only industry virtual reality will increasingly affect. Here are three real-world scenarios where WebVR could add layers of depth to the experience you offer your customers, not to mention the potential for your business’s revenue. While model homes can provide some insight into what a new home might look like, imagine this instead: You put on your VR headset and you’re able to virtually explore a property that is for sale, perhaps even having the ability to customize details (such as paint colours, furnishings and finishes) to get a true visualization of what your new home might look like. These are the kinds of experiences real estate agents, property management companies and property developers are beginning to offer their customers through the power of virtual reality. It’s a tool that Forbes says has the power to revolutionize the industry - so long as the industry is willing to adopt it. Why wouldn’t real estate companies want to jump on this? Now that innovations such as React VR have the capacity to allow real estate companies to layer these experiences on top of existing compatible offerings, including VR experiences as part of your business is becoming more attainable than ever. They could be offered as a premium service that you add on to increase your revenue and enhance the buying experience for your customers, or a tool used to attract and propel sales. If you’re already using React to fuel your experiences, adding a VR component is a natural progression. The endless aisle: that coveted digital catalogue of a company’s entire inventory available for shopping online, anytime; one big long virtual aisle where consumers can find everything they’re looking for. Virtual reality promises a whole new way of looking at online shopping. Imagine building an application that brings the store to your customers wherever they are. Providing your customers with a virtual shopping experience that actually feels like they’re walking through a reimagined brick and mortar store is one of the many possibilities WebVR could bring to retail. Alternatively, perhaps in this experience they can select the items they want to see and then these items can be displayed side by side in 3D as if they were being compared in a physical store. There is an endless aisle of opportunities that WebVR could bring to the retail industry. These are merely a few imagined possibilities. The media industry is perhaps where we’re beginning to see VR’s potential explored most openly, and perhaps most naturally. Companies such as Verizon Communications have started acquiring virtual reality-focused businesses to combine VR with 360 degree video. “There is no frame in VR. The shot you’re taking is above, below, and around. The frame is removed. You're not just thinking what fits in a 16 by 9 window, but you are thinking about what's behind and in front of you,” said Tyson Sadler, the director of a recent VR documentary collaboration between the Huffington Post and RYOT News that was a result of the Verizon acquisition. The documentary, “The Crossing,” is “an immersive reporting series hosted by Susan Sarandon chronicling the refugee crisis as it unfolds in Greece.” It puts viewers on the frontline of the story, allowing them to experience it as if they were there. This not only applies to media, but real estate, retail, eCommerce and beyond. Putting the customer into an immersive experience connects them with your product, your offerings, and your story in an innovative new way. Imagine premium content that allows a viewer to dive into VR experiences that let them swim in a shark tank from the safety of their living room, or a news story that puts them right on the frontlines. Ready to try WebVR? Talk to us today.